A mapping specification describing how the data stored in the concrete data sources of the organization may be understood in terms of the conceptual model. A set of event data annotations that express how event data can be extracted from the conceptual model, i.e., how the notions of case, events, timestamps, and event attributes may be located inside the conceptual model. Technically, the conceptual model and mapping specification rely on the Ontop framework, and the annotation links the conceptual model to the XES standard for event data. Once the three components are specified and linked to concrete data, the framework allows for the automatic extraction of a XES event log in accordance to the provided annotation. More infos may be found in our RW 2017 paper. OnProm is an ongoing effort. We are currently working on the optimization of the different techniques involved in the framework, and on the realization of a full, mature pipeline of tools for graphically visualizing and annotating the conceptual model. The latest version of the tool can be downloaded from the onprom website. OnProm is an ongoing effort, originally started by Marco Montali together with Diego Calvanese and Wil van der Aalst. A first, preliminary implementation has been developed by Alifah Syamsiyah in the context of her Master thesis. Currently, Emre Tahir Kalayci and Ario Santoso are the main driving forces behind the implementation effort. jREC is a JAVA+Prolog-based tool for reasoning upon the dynamics of an event-based system with respect to an Event Calculus specification. More specifically, jREC dynamically acquires the event occurrences characterizing a running execution of the system and monitors their effects by updating the evolution of the corresponding fluents (i.e. properties varying over time) according to an Event Calculus theory. jREC is based on a lightweight axiomatization of Chittaro and Montanari's Cached Event Calculus (see the paper Efficient Temporal Reasoning in the Cached Event Calculus), which captures a form of proactive reasoning where the current fluents' maximal validity intervals are cached and then updated/revised as new event occurrences get to be known. In this way, the reasoner avoids restarting from scratch every time a new event happens (which is the case of classical EC deductive reasoners), thus tracking the system's execution efficiently. jREC UI, a user interface that graphically depicts the evolution of fluents in response to events. In addition, a jREC tester is available as a runnable JAR. Two other tools are based on jREC: MOBUCON and ComMon. jREC is the core package containing the reasoner interface, a reasoner implementation consisting of a lightweight Prolog-based axiomatization of the Cached Event Calculus and TuProlog as the Prolog engine, and the JAVA models for storing execution traces and the evolution of fluents. Furthermore, jREC adopts a specific binary term status/2 to model multi-valued fluents, where status(F,S) means that fluent F has current value S. A simple domain-dependent theory can be downloaded here. public boolean setModel(String model) throws Exception - sets a domain-dependent theory (embedded in a string). public FluentsModel start() throws Exception - starts the reasoner; the returned fluents' model contains all the fluents that hold initially. 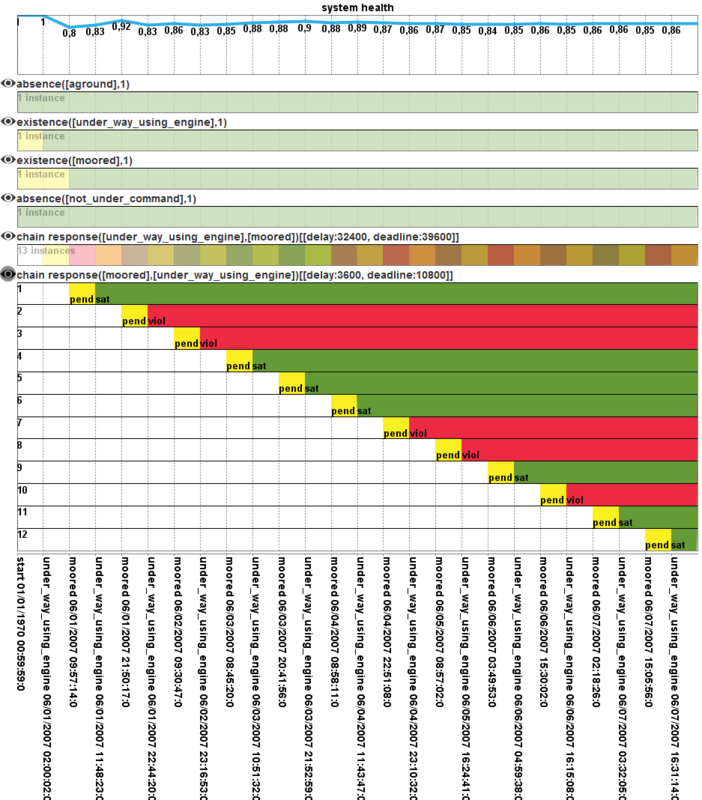 public FluentsModel evaluateTrace(RecTrace trace) throws Exception - evaluates a chunk of event occurrences (i.e. a partial or complete trace) extending/revising the previously computed result and returning the fresh one; if the trace is closed, then the reasoner clears the cached result. Note that event occurrences can be also delivered out of order. public long getStats() - returns the ms needed by the reasoner to process the last chunk of events. public boolean shutDown() throws Exception - shuts down the reasoner. The sources of jREC can be found here. The tool depends on TuProlog and on Log4J. Recall that the the tool is a research prototype, is undocumented and will print a lot of nonsense debug messages. A new, more mature version of the tool is likely to be implemented soon. jREC UI is a user interface package for the visualization of a fluents' model. Each "normal" fluent is visualized in a row, showing the time intervals in which it holds; all the status fluents referring to the same fluent are packed in the same row, supposing that each fluent can be in a single status at a given time. The sources of jREC can be found here. The package depends on JFreeChart, on the ui package SlickerBox developed by Fluxicon, and on the two ui packages UItopia and UITopiaResouces (see ProM 6). Recall that the package is still under development. The save button will always work on that file (overwriting it). In order to preserve a certain domain theory, copy the model.txt file. The domain-dependent theory must use term exec(Event) for representing events, while event occurrences are simply given in the run panel as Event Time, one per row. Each time the log button is pressed, all the event occurrences contained in the panel are delivered to the reasoner. jREC Tester can be downloaded here. Unzip the file and simply double click on the JAR, without changing the name of the subfolder and of the resource files contained inside it. jREC has been developed by Marco Montali during his Post-Doc within the AI group at DEIS, University of Bologna. an operational decision support provider for ProM 6 for wrapping the reasoning facility and offering it through the ProM operational support service, together with a plug-in for parsing ConDec models exported from the DECLARE system. two test clients for delivering events to the MOBUCON operational support provider, one supporting the manual insertion of events, the other loading traces from a XES event log; the clients graphically report the evolution of the business constraint instances, together with a metric measuring the health of the system (i.e., "how much" it complies with the business constraints). A description of the framework can be found in our FASE 2012, ACM TIST 2013, and SAC 2013 papers. run, the panel for delivering event occurrences and see the outcome. See the sample content to have a grasp about the approach. The second tester is related to our SAC 2013 paper, and extends the previous one with non-atomic activities and data-related conditions. A new version of the tool is likely to come soon. The implementation of MOBUCON has been started by Marco Montali in july 2011, when he was visiting researcher at the Eindhoven University of Technology. A special thank goes to Wil van der Aalst and Fabrizio Maggi, and to the Netherlands Organisation for Scientific Research (NWO), that financially supported the visit. jREC as the underlying reactive reasoner. A description of the framework can be found in our AT2AI 2010, DALT 2011, and JAAMAS papers. run - the panel for delivering event occurrences and see the outcome. See the sample content to get a glimpse of the approach (a file trace.txt is provided to show a sample trace). ComMon has been developed by Marco Montali during his PhD and Post-Doc, when he was part of the AI group at DEIS, University of Bologna. CLIMB (Computational Logic for the verIfication and Modeling of Business constraints) is a framework based on computational logic (extensions of logic programming in particular) for the declarative, constraint-based specification of event-based systems (such as business processes, service interaction, clinical guidelines, multi-agent interaction protocols), and for providing reasoning and verification support along their entire lifecycle. 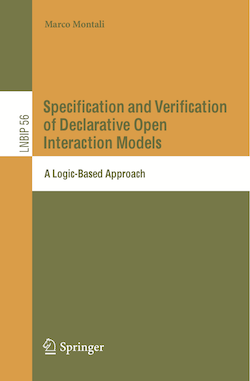 CLIMB is extensively described in my monograph Specification and Verification of Declarative Open Interaction Models: a Logic-Based Approach. ConDec, a graphical constraint-based language for the declarative and open specification of business constraints. The language has been proposed by Maja Pesic and Wil van der Aalst, and is the core of the DECLARE system. SCIFF (based on abductive logic programming) and the Event Calculus as the underlying logic-based formal counterpart. All the ConDec constraints can be automatically translated onto a SCIFF or EC specification. Properties verification, a-priori compliance verification and composition are tackled by the g-SCIFF proof procedure, the generative variant of the SCIFF proof procedure (see Ch. 8, 9, 10 and 11 of the book). A special SCIFF template project (see the SCIFF manual), dealing with the specification and verification of CLIMB constraints, can be downloaded here. The project provides a facility for automatically producing, starting from a simple description of a CLIMB model (see the sample file model.pl), the corresponding SCIFF representation; it is executed when the project is loaded. Furthermore, it provides a number of utilities for properties verification, such as conflicts detection and discovery of dead activities (see climbUtils.pl). On-the-fly compliance verification is tackled by the SCIFF proof procedure, interleaving it with g-SCIFF in case of speculative runtime verification (see Ch. 13 of the book). Monitoring is tackled by means of the Event Calculus and corresponding runtime reasoners (see Ch. 14 of the book). 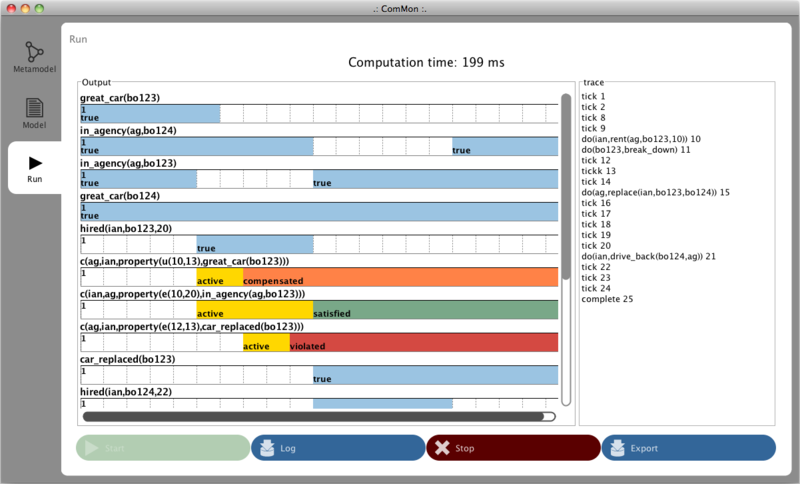 The currently supported runtime reasoner is jREC, and the monitoring tool for extended ConDec models is MOBUCON. Alternatively, a reactive EC reasoner again based on SCIFF is described in Ch. 14 of the book and in the paper A Logic-Based, Reactive Calculus of Events. Enactment is managed by interleaving monitoring and speculative runtime verification (see Ch. 14 of the book). Declarative process mining (model discovery and trace analysis) are respectively handled by SCIFF or Prolog and by the Inductive Logic Programming algorithm described in the paper Exploiting Inductive Logic Programming Techniques for Declarative Process Mining. Two ProM plug-ins have been developed for dealing with these tasks: SCIFF Checker for conformance checking and DecMiner for model discovery. The CLIMB framework has been investigated by Marco Montali during his PhD and Post-Doc, when he was part of the AI group at DEIS, University of Bologna. The SCIFF framework has been developed by the AI Groups at DEIS, University of Bologna, and ENDIF, University of Ferrara. 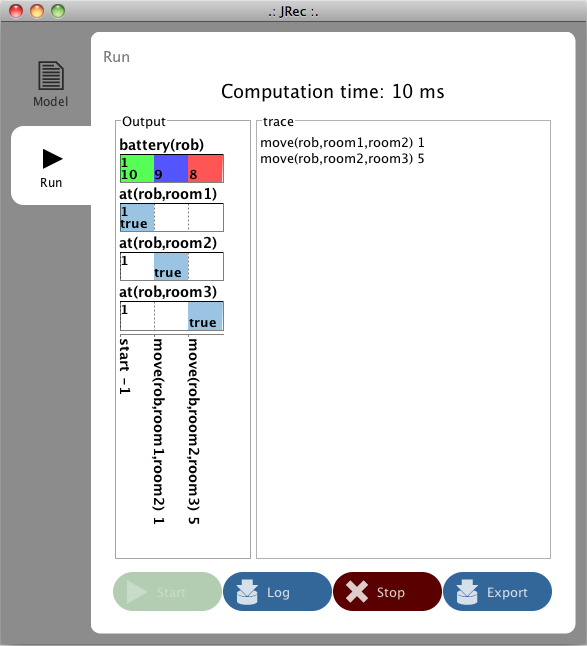 DecMiner has been developed by Evelina Lamma, Fabrizio Riguzzi, and Sergio Storari (AI Group at ENDIF, University of Ferrara). Part of this investigation has been carried out visiting the AIS group at the Eindhoven University of Technology, and in particular collaborating with Prof. Wil van der Aalst, Maja Pesic and Fabrizio Maggi. SCIFF Checker is a process mining tool for conformance checking and ex-post analysis of event logs. It is implemented in JAVA+Prolog as a plug-in of ProM. The plug-in classifies the execution traces contained inside an event log as compliant or noncompliant with respect to a business rule. Rules are expressed in a pseudo-natural language notation and are inspired by the patterns of the ConDec language extended with metric time constraints and originators. The user selects an abstract business rule from a set of templates. Rules contain event patterns and expectations, which are in turn associated to an activity name, an event type (e.g. start, complete, abort of an activity), an originator and an execution time. By clicking on the "customize" button, all the editable parts of the rule becomes visible and active. An element can be edited by fixing its value and/or adding specific constraints. Customized rules can be saved for future re-use. Finally, the user can fix the time granularity used for the analysis and launch the analysis task. Such a task is carried out in Prolog, using the approach described in the paper Checking Compliance of Execution Traces to Business Rules. The final result is a partition of the input log into a compliant and noncompliant set. A new analysis phase can be then carried out by considering the whole log or only one of the two sets. Such sets can also separately feed other plug-ins. The tool is currently under porting on ProM 6.
plugins contains the jar of the plug-in (SCIFFChecker.jar) and a subfolder (SCIFFChecker) which includes two xml files that store the abstract rule templates and the user-defined rules. Both the jar and the subfolder must be copied into the <Prom Distribution>/lib/plugins/ folder of ProM. external contains the external libraries required by SCIFF Checker, i.e. TuProlog and JFreeChart, which in turn requires JCommon. All these three jar files must be copied into the <Prom Distribution>/lib/external/ folder of ProM. where <NEW KEY> is a unique alpha-numeric key. 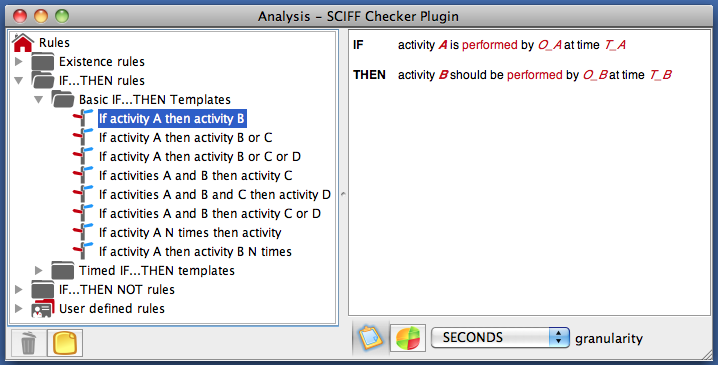 SCIFF Checker will consequently appear inside the analysis menu of ProM. 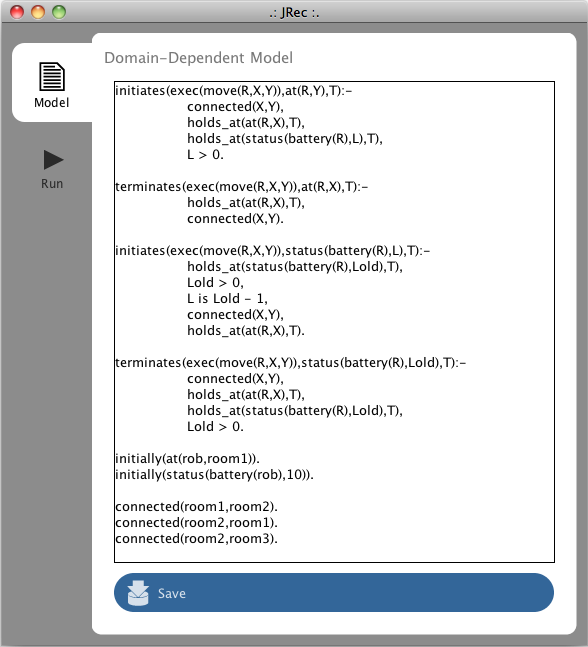 SCIFF Checker has been developed by Marco Montali in the context of a research contract within the AI group at DEIS, University of Bologna. The Prolog-based analysis task is a joint work with Federico Chesani and Paola Mello (AI group at DEIS, University of Bologna) and Fabrizio Riguzzi (AI group at ENDIF, University of Ferrara).